Whimsy is like pollen; different people have different levels of resistance to it. Some people can stand a high dose of whimsy, others are sent into an apoplectic rage by its very presence. I fall somewhere in the middle, which may explain why I liked The Science of Sleep, even though I went into it with some very negative apprehensions. I kind of wanted to hate it since it just sounded like it would consist of suffocating levels of whimsy, but it was pitched just perfectly. Gael Garcia Bernal plays Stephane, a half-Mexican, half-French graphic artist who returns to Paris following the death of his father and winds up with a job as a type-setter for a calendar company, a job he hates. Since childhood, Stephane has used his dreams to escape from the drudgery of everyday life and this tendency goes into overdrive when he falls for his neighbour, Stephanie (Charlotte Gainsbourg, who seems much nicer in roles where she's not performing an auto-clitoridectomy), who seems to share his passion for make believe, as evidenced by her willingness to make a short animated film with him shortly after they meet for the first time and grasp of animation techniques. The conceit of having much of the film take place within the dreamscape of Stephane's mind allows Michel Gondry to fully indulge his fetish for physical, in-camera effects. Gondry's work, both as a feature film director and a music video director, has always displayed a love of the mechanics of cinema and the way in which the most simmplistic piece of sleight of hand can prodcue the most powerful reaction from an audience. 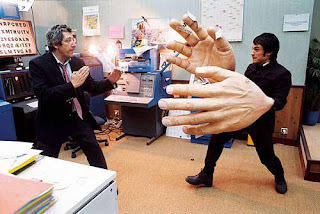 Throughout the film, he uses large props (fans of his video for 'Everlong' will appreciate the giant hands), stop-motion animation and expressionistic set design to create Stephane's dream world, which he interweaves beautifully with the real world to such an extent that the line between the two becomes very blurry indeed, creating a somewhat childish view of adulthood that matches Stephane's state of prolonged adolescence. The cardboard sets and props are like something out of a creative child's playroom, and the film portrays Stephane as something of an overgrown child, though Gondry seems to feel a kinship for that mindset, given his work in general, and does not condeem such an existence as films with a similar protagonist often do. The story is often criticised for being nonsensical, a claim which itself nonsensical. The story is very basic and easy to understand; boy meets girl, boy wants girl but is too afraid to make the first move, girl wants boy but thinks he likes her best friend. It's a very simple, almost banal story. The complexities lie in its execution and the emphasis on dreams as a means of processing emotional information but which also provide solace for those who can not handle real life. Stephane retreats so far into his own thoughts that on several occasions he finds himself doing things in dreams, waking up, then finding out that he has done them in real life as well. This can be funny, particularly when we see the contrast between the rather rough and tumble world of Stephane's dreams, complete with sets made from egg cups and cars made of cardboard, and the dreariness of his reality, but there's a melancholy side to this as well, as anyone who has ever had a very vivid dream of being in relationship will be able to understand. Bernal and Gainsbourg are both thoroughly charming as Stephane and Stephanie, both playing parts that could very easily go the wrong way; as an over-grown dreamer, Stephane could have just been a petulant child, whilst Stephanie could have become an archetypal 'quirky' idealised figure of the hero's affections. It's to their eternal credit that both the performers and Gondry manage to ground the story so well, providing an emotional base from which the whimsy can spread. The relationship between the two is endearing, rather than cloying, and neither overplays the part, despite the temptation there must have been for them to engage in all sorts of wackiness. I couldn't help comparing it to Eternal Sunshine of the Spotless Mind, which is still my favourite of Gondry's feature films, since both revolve around emotionally stunted men finding some solace in the realm of their own mind. The Science of Sleep manages to be a much warmer film than Eternal Sunshine, thanks to the absence of Charlie Kaufman's depressive tendencies, but this same absence means that the film lacks the mournful, heartbreaking quality that endeared the earlier film to me. Far better than I thought it would be, I have to admit.